Linguistically, the art parquet indicates success and a breakthrough in artistic creativity. It can be heightened still further by prefixing it with the adjective “international”. “Glory on the Art Parquet”, for example, was the headline of an article in the Swiss economic magazine CASH dedicated to the art journal «Parkett», published to mark an exhibition at the MOMA in homage to the journal. The curator Deborah Wye paid tribute to the journal’s achievements by saying that “many made their first successful appearance in the spotlight of the global art world as a result of «Parkett»”. When Googling, one finds the term applied to an illustrious circle of art producers or gallery owners. Museums and foundations advertise with the fact that at least some of the artists they are showing or sponsoring have been admitted onto this exclusive “dance floor”. So those who waltz on the parquet of the art world have truly made it: their creative work transforms into art, and this “good art” can now be traded as “goods”: art whose worth lies less in the ideal than in stock and investment value. One discovers little about the concrete state of the art parquet; it is the actions of re(e)valuation that take place on it and its function as a marketplace for art that are decisive. 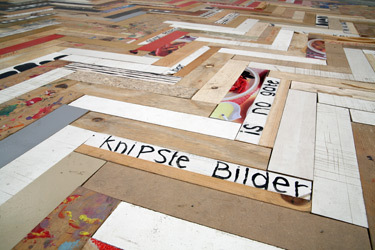 The installation ART PARQUET materialises the linguistic metaphor, giving it a physical form. The “walk-on” floor covering democratises access to the “art parquet”. Art parquet is produced from material that originates directly from art production, functions as a presentation surface for art, protects art during transport, or is part of an artwork. Stretcher frames, laths or other construction components, easels, etc. Parts of sculptures, installations, art works. Parts of presentation walls, display cases etc. The minimum dimensions for your donation are 10 x 40cm. The pieces do not have to be sawed exactly. Bigger pieces are welcome. is a videodocumentation of KUNSTPARKETT by Matthias Merkle for web broadcaster Sender Freies Neukölln.